Dartmouth will award honorary degrees to six individuals at the upcoming Commencement ceremony on June 10. Each recipient will be awarded a Doctor of Humane Letters. The recipients’ professional experiences cover several industries, ranging from entertainment to public service to medicine. The honorary degree recipients are Dartmouth trustee and retired Goldman Sachs partner Peter Fahey ’68 Th’69 Th’70; former congressman and representative to the United Nations Frank Guarini ’46; global public health practitioner and surgeon William Holmes ’79; Sylvia Kaaya, psychiatrist, researcher and dean of the School of Medicine at Muhimbili University of Health and Allied Sciences in Dar es Salaam, Tanzania; actor, producer and writer Mindy Kaling ’01; and co-founder and co-executive chairman of the Carlyle Group David Rubenstein. Kaling will also deliver the Commencement speech. Fahey, a self-described “uber Dartmouth supporter,” is perhaps best known on campus for being the namesake of the dorm on Tuck Drive, but he supports all sorts of endeavors across campus. A former Big Green basketball player and two-time Thayer graduate, Fahey is the chair of the Friends of Dartmouth Basketball and on the Board of Advisors for the Thayer School of Engineering. He is also the president of the Class of 1968, which celebrates its 50th reunion this year. Corresponding with his career in politics and international relations, Guarini is a longtime supporter of international study and travel and endowed Dartmouth’s Guarini Institute for International Education. He has subsequently been recognized as the namesake for the Frank J. Guarini School of Graduate and Advanced Studies after making a substantial gift to support its formal creation for “The Call to Lead” capital campaign. Holmes has worked for nearly four decades in global health. Originally trained as a general and plastic surgeon, Holmes has gone on to provide clinincal services and training on all seven continents. He has worked with a wide variety of governments and health agencies to provide service around the globe. Kaaya, a leading psychiatric researcher at MUHAS, is one of about 60 mental health specialists in Tanzania who focuses on developing practices that can benefit countries with limited resources. She connected with Dartmouth through the DarDar partnership, which was founded in 2001 to connect Geisel and Muhimili University to tackle global health issues. In addition to his work founding the Carlyle Group, a private equity and asset management corporation, Rubenstein serves as chariman of the Board of Trustees for the John F. Kennedy Center for the Performing Arts, the Smithsonian Institution and the Council on Foreign Relations, and as a trustee for several other organizations. He has previously served as co-chairman of the board of the Brookings Institution. According to secretary for the alumni committee on honorary degrees Meghan Ramsden ’87, the committee canvases the alumni body before forwarding three to five names to the faculty council on honorary degrees, which then makes the final decision of who receives the awards. Ramsden wrote in an email statement that the decision making process for selecting alumni nominees for honorary degrees is highly confidential, but deliberations regarding potential candidates are conducted throughout the year. College spokesperson Diana Lawrence wrote via email that the process for the faculty council in selecting recipients is also confidential, but the council looked for the following kinds of people in selecting a pool of nominees: candidates who have made or are expected “to make significant contributions to a field or society in general,” candidates who serve as a role model for students, candidates who are from historically underrepresented groups and candidates who represent a range of interests. Lawrence added that recipients must be able to be present at Commencement to accept an honorary degree. Holmes said he is “humbled and honored” to receive an honorary degree from his alma mater, but he said this recognition came at him “totally blind.” Coming back to Hanover presents him with the opportunity to return to the U.S. for the first time in two years. In the 39 years since he graduated from Dartmouth, Holmes said he has spent nearly 20 years working in over 50 countries, serving communities, non-profits and governments around the world with his work in public health. Fahey, Holmes and Rubenstein all noted the importance of pursuing one’s own interests when asked to reflect on their own careers and give advice for graduating students. “[Students] should experiment and try many different things, because it’s very rare that somebody will find exactly what they want to do with their life the day they graduate,” Rubenstein said. Rubenstein also said that students should consider how they can serve their country in deciding how to spend their time, efforts, and resources. Working in the public sector before moving to the private sector allowed Rubenstein to view service from different angles, from working directly in the White House to providing service through philanthropic means. 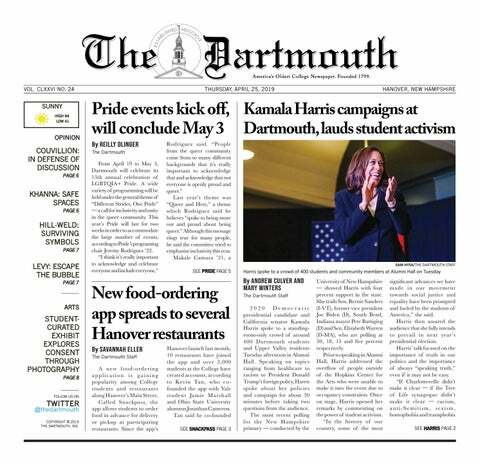 Fahey said that the first several years after graduating will likely be incredibly difficult because of adjusting to life away from the “ideal environment” in Hanover, where students are surrounded by talented peers and faculty. However, he also noted that those first few years are the best for trying out different jobs before deciding upon a career. Holmes said he followed his interest in working overseas following medical school, which enabled him to pursue subsequent developing interests in clinical work, development and consulting. Holmes noted that the differences in his work experiences and environments allow him to have balance in his professional life and to ward off boredom. “What students should do is find something they’re intellectually connected to that they find interesting and make that a part of their lives,” Rubenstein said.